Combining science and art, Gage Green Group offers the finest cannabis genetics in the world! Their work of preserving and continuing prized cannabis lines involves rigorous tests, breeding, and documentation. 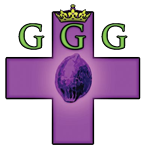 Gage Green Genetics improves upon the world\'s legendary and elite cannabis phenotypes. All hybrids undergo extensive selection trials to ensure the development of champion varieties. Gage Green Groups collection includes all the rare and authentic clone-only genetics there is. Patients deserve access to potent connoisseur genetics. With Gage Green Genetics, you will discover your own unique champions.